Your body may have changed with aging, physical activity or due to pregnancy but you don't have to live with pain or incontinence. Working with a therapist one-on-one to follow a tailored plan, allows you to get real results quickly. We’ll give you exercises to help you heal your body and make sure you do them in a way that is safe and effective. Surgery is not always necessary to get the results you want. We can help you heal your body naturally and get back to normal. You do not have to work through your body’s issues by yourself and you don’t need to feel embarrassed about the changes in your body. If you are experiencing any of the following, we can help! We love empowering our patients to know their body and know how to recover. You’ll leave each session armed with knowledge and a plan to regain your confidence and get your body to where you want to be. Our Women’s Health Therapists are highly trained and specialized to get you results. We provide personalized therapy and highly-effective, individualized treatment for physical dysfunction in the pelvic, abdominal, hip and low back regions. We work to correct pelvic dysfunction and pain that can occur as a result of life changes, such as having a baby. Education & preventative measures before childbirth to help ease pain associated with pregnancy and strengthening to account for body changes. Education of pelvic floor anatomy & function. Exercises or relaxation of pelvic floor and associated muscles using biofeedback. Bladder re-training exercises and helpful lifestyle modifications for urinary leakage. Gentle internal/external hands-on techniques, as indicated, including stretching, soft tissue massage & joint mobilization. In a private setting, we’ll do an extensive review of your condition and learn about your goals for your body. From helping you learn how to heal pain during pregnancy, postpartum, or following trauma to dealing with an organ prolapse or incontinence, we’re here to help you get the best results possible. With education and gentle techniques, you’ll be back to where you want to be in no time. It’s important to us that you have access to local, top-of-the-line education and exercises when it comes to women’s health. At some point in their life many women have pelvic floor issues and we’re committed to helping you get your life back to where you want it to be. Our women’s health therapists are trained to not only ask the right questions to give you the correct plan, but are also incredibly confidential and understanding. As women, mothers, and physical therapists, we know exactly how important it is that you feel comfortable. You don’t have to be embarrassed and you deserve the support of trained professionals. 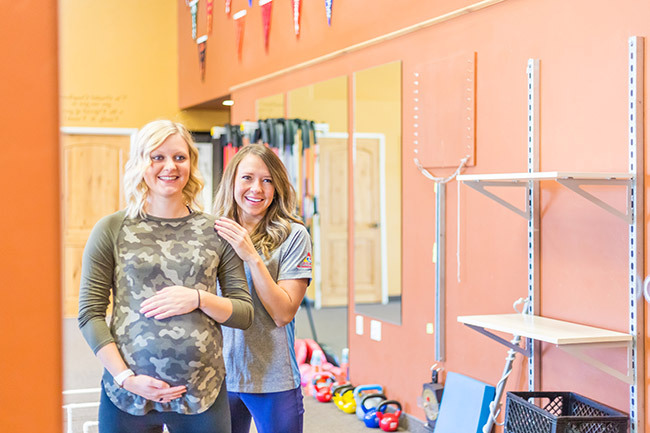 We love taking care of women of all ages, but we especially love to connect with women to prevent issues before childbirth to help ease any pain or strengthen areas of your body that have changed over time. Our approach is more than exercise-it’s a true education in understanding your body so you can function without pain, no matter what you love to do.